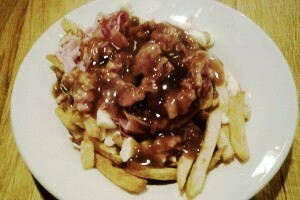 Authentic smoked meat brought straight from Montreal, complimented by homemade Poutine with St. Hubert sauce. 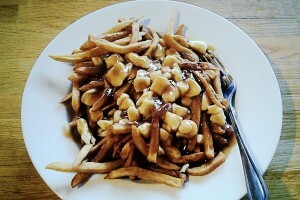 Hand cut fries with cheese curd & gravy. With pickles and medium coleslaw or daily soup. Hot dog with your choice of topping on a steamed bun. Hand cut fries with sliced BBQ hot dog, cheese curd & gravy. 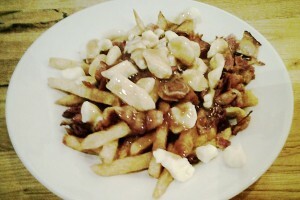 Hand cut fries with Montreal smoked meat, cheese curd & gravy. (Spicy, Regular, or BBQ with grilled onions). Hand cut fries with bacon, cheese curd & gravy. Sandwich, poutine, and pop. (All combos come with pickle & coleslaw). Sandwich, fries & pop. (All combos come with pickle & coleslaw). Small sandwich, poutine, and pop. (All combos come with pickle & coleslaw). Made with cheese curd, mozzarella cheese and sauteed onions. Sautéed onion, cheddar cheese & fries. Sauerkraut, Swiss cheese grilled with fries. 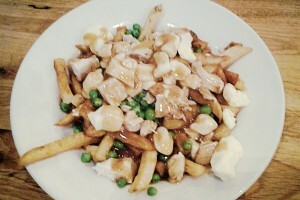 Hand cut fries with roasted chicken, peas, cheese curd & gravy. 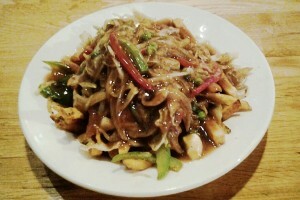 Hand cut fries with sauteed onions, bell peppers, mushrooms, peas & coleslaw with gravy & cheese curd. Hand cut fries with scrambled eggs, onion, bacon, cheese curd & gravy. Hand cut fries with meat sauce & cheese curd. 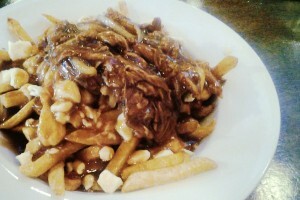 Hand cut fries with steak, sauteed mushrooms & onion, cheese curd & gravy. 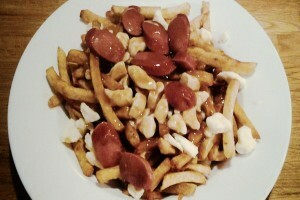 Hand cut fries with salami, Montreal smoked meat, BBQ dog with cheese curd & gravy. Onions, ground beef with cheese curd & gravy. With your choice of : Ketchup, mustard, relish, onion, coleslaw, sauerkraut. Veggie dog with your choice of toppings. Hot dog bun with coleslaw, mayo, tomatoes & onions. Hot dog bun with eggs, coleslaw, mayo, tomatoes & onions. Hot dog bun with chicken, coleslaw, mayo, tomatoes & onions. One steamie, fries and pop. One steamie, poutine and pop. Two steamies, poutine and pop. Two steamies, fries & pop. Smoked Meat Steamie or Bacon Steamie or B.B.Q. Steamie with Fries. Soups - Soup of the day. Chicken strips served with fries & dipping sauce (honey mustard, honey garlic, BBQ). 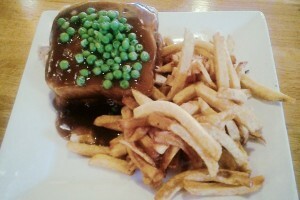 Roast chicken between toasted white bread covered in gravy & peas served with fries. 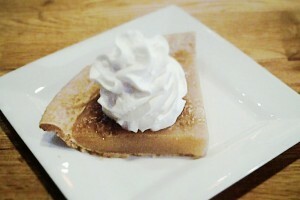 Quebec style meat pie served with gravy, fries & coleslaw. 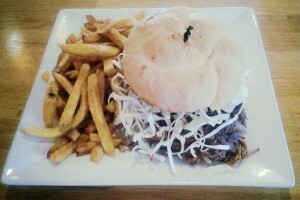 Pulled pork with sautéed onion served on a toasted bun with BBQ sauce and coleslaw with fries. Available on white or rye, served with fries. 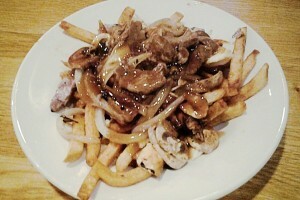 Sauteed onions, mushrooms, gravy with fries. Bacon, chicken, lettuce, tomatoes, and gravy with fries. Bacon, lettuce, tomato, rye or white bread. Bacon, egg, lettuce, tomato with fries, rye or white bread. Not Available Monday & Tuesday. Dark meat, St. Hubert sauce, bun, coleslaw and fries. White meat, St. Hubert sauce, bun, coleslaw and fries. St. Hubert sauce, bun, coleslaw and fries. Ketchup, mayo, sauteed onion, lettuce & tomato. 100% AAA Beef. Comes with fries. Crispy chicken, tomato, lettuce, onions & fries.